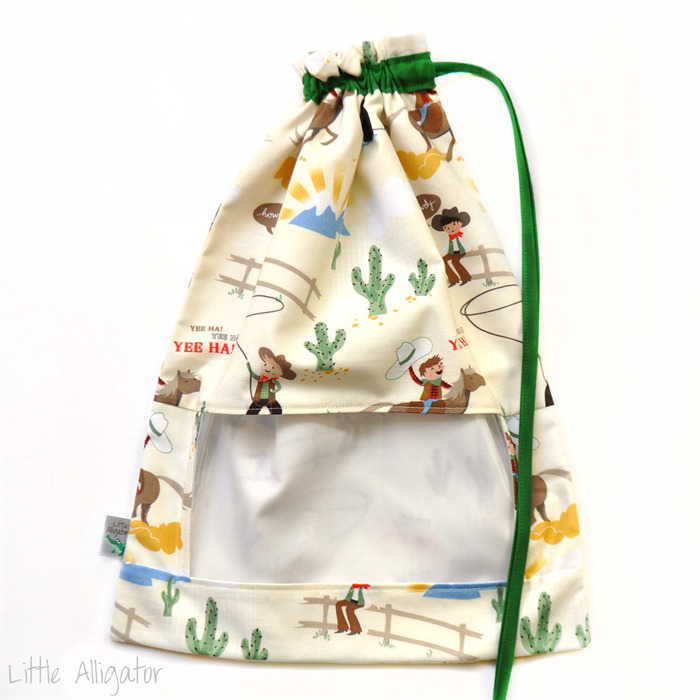 Drawstring Toy Bag. Peek-A-Boo Bag. Retro Cowboy & Horse Cactus & Desert. CHRISTMAS / NEW YEAR POSTAGE: Turnaround times are longer over the holiday period. Orders placed between 20th December and 3rd January will be dispatched two weeks from the order date. 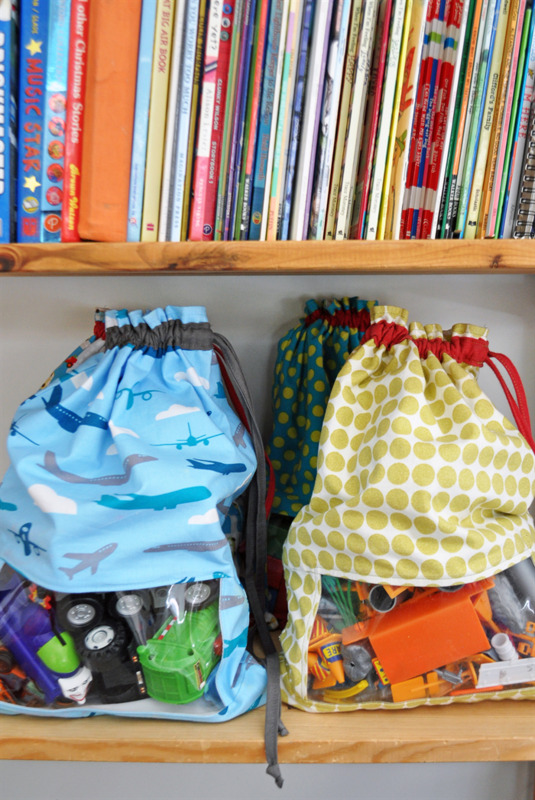 These beautiful handmade drawstring toy bags are so versatile and practical. They make organising and tidying up kid's toys much more enjoyable! The clear vinyl window means it's easy for everyone to see where toys belong. They look fabulous sitting on a shelf in a playroom or child's bedroom. They're a fantastic storage option especially if you're short on space or if you can never find the right size boxes to fit your selves. You can stack them on top of one another and make use of any available space. They're easy to fold and store when not in use. Lightweight yet extremely durable, young children can easily carry them around. Great for carrying on plane, car trips. Pop special toys and books in them so kids have easy access. Mums can keep baby toys, books & gear organised within their hand luggage or they can be used to separate kid's toys, books and games in suitcases. Great for keeping playsets all together: trains, blocks, wooden food sets, lego, dolls accessories, tea sets, animals etc. Works well as a library bag and fits most book sizes. Ideal for baby showers. 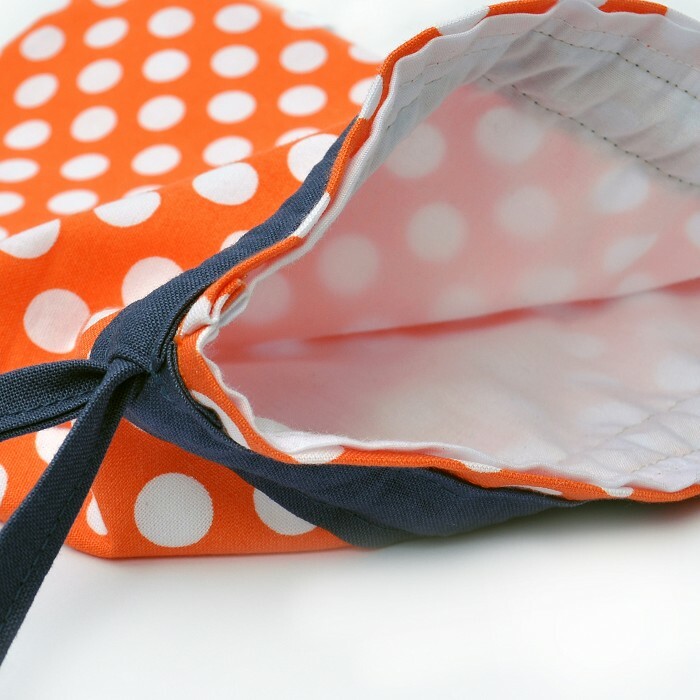 Alone it makes a lovely, practical gift or use it to fill with nursery/ baby pressies. Later it becomes a toy bag! A unique gift for toddlers and children – a special gift bag with (or without) a present inside. Front and back are fully lined with white cotton. All edge seams have been double stitched for durability. * Please note that the additional photos are for display purposes only and the third photo is an example of the interior of each bag. The bag for purchase is shown in the first photo. Payment Instructions Payments can be made through Paypal. You can choose to pay via your Paypal account or using your credit card. Payment must be made within 15 minutes if you choose this option. For Australian customers, I also accept payment via Direct Deposit. All items will not be sent until payments have been cleared. Direct deposit may take several days to clear.